This Copenhagen hotel is located just opposite Tycho Brahe Planeetarium. Tivoli Gardens is only 500 meters from the Scandic Hotel Copenhagen. Numerous restaurants, bars, cafes and coffee shops are located not far from the hotel. There are also many shopping opportunities available in the immediate area. 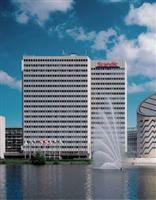 The airport is only 12 kilometers from the Scandic Hotel Copenhagen. There is a car park located on site at the hotel for the use of guests who arrive by car. Public transportation services are available around the hotel, making it easy to access the hotel. Each of the guestrooms at the Scandic Hotel Copenhagen features a work desk, mini-bar, in-house movies, cable TV and private bath. Some guestrooms offer waterfront or city views. There are 486 guestrooms at the hotel. Guests of the Scandic Hotel Copenhagen will be able to enjoy such amenities as gym access, Internet access, children's playground, two bars and a shop. The hotel also offers a breakfast buffet. Massage services are available through the hotel. The hotel has been certified as environmentally friendly.